I'm planning to go to Germany on Sept 6-8, then Netherlands on Sept 8-11 and exit Switzerland on Sept 11-14. Which embassy do I need to apply for the Schengen visa? The number of days are the same for Netherlands and Switzerland, but I'm planning to apply in Netherlands since it will be my second point of entry. “you should apply where you would be staying maximum number of days. If you are spending equal number of days in Schengen countries, then you will have to apply where you will be entering first." Which Embassy to apply for a Schengen visa? The number of days is the same for Netherlands and Switzerland? With the provided itinerary, it really looks simple to apply for Germany because of equal number of days in each Schengen countries. However when we reach Schengen Embassy/Consulate or VFS (Visa Facilitation Center), they normally start counting with provided hotel/accommodation booking by nights for each member Schengen member states. 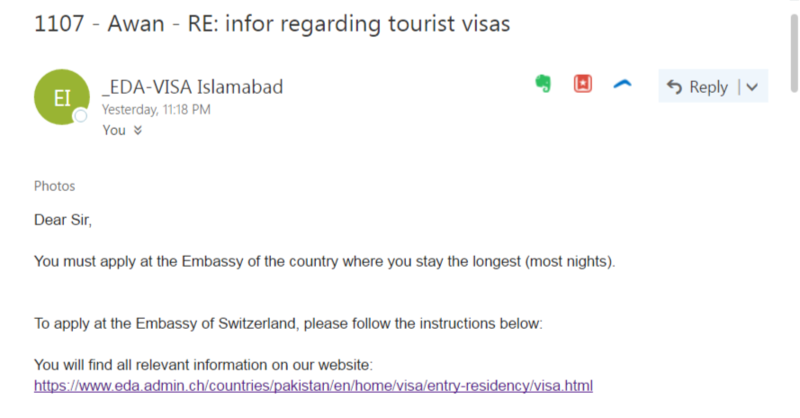 So obviously we cannot apply to Germany because applicant is just staying there for 2 nights. However there is equal number of nights stay in between Netherlands and Switzerland, therefore applicant has to apply for Netherlands because he will be entering Netherlands before Switzerland. Personally with my own experience with German and Italian Consulates I noticed the same procedure whenever I applied for a Schengen visa, I still need to justify my answer from Schengen Embassy/Consulate. In your case, as you are staying equal amount of days in multiple countries it is Germany as that is your first port of entry. You must apply for the visa at a mission of the Schengen country of your journey’s main destination or the Schengen country where you intend to stay the longest. If you will be staying an equal length of time in more than one Schengen country and cannot designate one of these countries as the country of your main destination, you must apply for your visa at the mission of the first Schengen country you intend to enter. Not the answer you're looking for? Browse other questions tagged visas schengen international-travel filipino-citizens embassies or ask your own question.